Chuckya's appearance in Super Mario 64 DS. 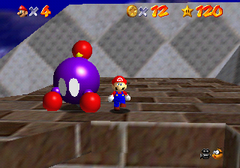 Chuckyas, also formatted as Chuck-Yas, are a large purple version of Bob-ombs found in Super Mario 64 and its remake. They have red spheres for hands and purple arms as well as red orbs on a yellow antenna on their heads, their backs have a black, diamond-shaped plate, and they move about by sliding across the ground on a metal point. In the remake, they have a slightly different appearance; their hands are now boxing gloves, their arms are grey and their antenna is white, and they lose the plate in exchange for a gold wind-up key on their backs, making them more closely resemble normal Bob-ombs. A Chuckya in Wet-Dry World from Super Mario 64. Chuckyas patrol a small area, occasionally pausing to turn around. When Mario is in range, they charge towards Mario in attempt to pick him up and throw him in a random direction, similar to King Bob-omb. To defeat a Chuckya, Mario must pick the creature up from behind and throw the Chuckya, causing the enemy to explode and release five yellow Coins. Yoshi cannot defeat these enemies in Super Mario 64 DS. They are found in Wet-Dry World, Tall, Tall Mountain, Rainbow Ride, the "huge" area of Tiny-Huge Island, and Bowser in the Sky, as well as the exclusive Battle Fort in the remake. The placement of Chuckyas usually means Mario can be thrown down a cliff or platform, taking fall damage upon landing, or even being thrown off the map and losing a life. When moving, they produce winding sounds, similar to Heave-Hos. In the original game, it is possible to escape from Chuckya's grasp by either pressing and/or pushing the control stick from the inside to the outside 11 times before Chuckya throws Mario. Horuhei From 「放る」 hōru, meaning "to throw". Based on Bomuhei, Bob-omb's Japanese name. Wurfmufti Wurfmufti: From würfen "to throw" and Mufti "guy". ↑ Prima Games' Nintendo DS Pocket Guide, page 327. This page was last edited on April 7, 2019, at 21:11.